A night spent building roads to nowhere and trading bricks for sheep may not sound like the most stimulating time, but true board game fans know differently. When The Settlers of Catan was first released over two decades ago, there was nothing else on the shelves quite like it. The game has since been credited with introducing German-style games to the U.S. and has been embraced by everyone from pro athletes to Silicon Valley CEOs. Whether you’re a novice player or a seasoned Catanian, here are 12 facts worth knowing about the game. 1. IT WAS INVENTED BY A GERMAN DENTAL TECHNICIAN. When Klaus Teuber developed The Settlers of Catan in the 1990s, board game design was just a side hobby for him. He had created award-winning games in the past, but his job at the dental lab was what paid the bills. Nonetheless, when his interest in Viking history inspired him to make Catan, he fully committed himself to the project. Perfecting the product took him four years, and after creating each prototype, he would gather his wife and kids around the board to act as his guinea pigs. When his family was finally too engrossed to be distracted with anything else, he knew he had something special on his hands. Even so, he could have never predicted what The Settlers of Catan would grow into. His final version—consisting of a stack of resource cards, some wooden houses, 19 hexagonal cardboard tiles, and two dice—debuted in Germany in 1995. The first run of 5000 games sold out so quickly that Teuber himself doesn’t have a first edition copy. Three years later he was able to retire from dentistry, and today he’s the managing director of his multi-million dollar business, Catan GmbH. 2. IT WON THE OSCAR OF BOARD GAMES. Unless you make board games for a living, chances are you’ve never heard of the Spiel des Jahres award. But to people in the industry, the distinction is a very big deal. Every year, the Spiel des Jahres (German for "Game of the Year") recognizes a new game that excels in the areas of concept, design, rule structure, and layout. The Settlers of Catan was honored in 1995, marking the fourth Game of the Year win in Klaus Teuber’s career. Catan also brought home nearly every other board game award of note that year, including an Origins Award for Best Fantasy or Science Fiction Board Game, first place at Deutscher Spiele Preis, and a Meeples’ Choice Award. 3. THE CREATOR PLAYS ANONYMOUSLY ONLINE. Creating a beloved board game has its perks, but there is one major downside: People are hesitant to play against you once they learn who you are. Perhaps that’s why Klaus Teuber has turned to the web to keep his Catan skills sharp. PlayCatan.com is home to over 80,000 active members, and Teuber is one of them. But if you were to go toe-to-toe with him online you would likely never know it, as he likes to keep his identity anonymous. 4. THE GREEN BAY PACKERS GOT HOOKED. Football and Catan are both incredibly competitive games that place an emphasis on strategy, so it shouldn't come as too much of a surprise that the game has been adopted as a bonding exercise by members of the Green Bay Packers. In 2015, The Wall Street Journal reported that team members would regularly meet for The Settlers of Catan game nights. "At first we’re like, 'What the hell is this? Brick? Wool? What kind of game is this?'" Green Bay center Corey Linsley told WSJ. But it wasn’t long before the players were fully invested. David Bakhtiari, the team’s starting left tackle and the player responsible for spreading Catan fever, would even go so far as to insist they play with zero background music so he could hear his opponents strategize. 5. THE STAR TREK EDITION LETS YOU SETTLE THE FINAL FRONTIER. The least exciting aspect of The Settlers of Catan may be Catan itself. For players looking for more adventure and less sheep, the Star Trek version offers a cosmic change in scenery. The gameplay is basically the same, only instead of collecting wood, grain, and wool you acquire water, oxygen, and dilithium, and instead of building roads you construct enterprises. The game also includes support character cards representing different characters from the original series, each with their own special ability that can be used twice throughout the game. The Star Trek edition is just one of dozens of products tied to the title, but it’s definitely in the running for nerdiest Catan collector’s item of all time. 6. THE LARGEST GAME EVER INVOLVED 1000 PLAYERS. Catan is best played with three or four people, maybe six at the most. That’s unless of course your goal is to break a world record. In 2015, 1040 participants—including Klaus Teuber himself—gathered around an expanded board at Germany’s Spiel convention for the largest game of Catan ever played. It nabbed the record from a game that took place in Indianapolis, Indiana two years earlier (only 922 players had showed for that event). 7. IF YOU’RE NOT INTO BOARD GAMES, YOU CAN READ THE BOOK. For anyone who prefers to experience their resource-trading adventures in solitude, the world of Catan also comes in book form. The Settlers of Catan was penned by German historical fiction author Rebecca Gable and published in Germany in 2003. Unlike some other examples of board games-turned-media, it’s actually supposed to be pretty good. Fans still holding out hope for a movie or TV show adaptation can keep dreaming: Air Force One producer Gail Katz purchased the film and television rights for the game in 2015, but she still hasn’t announced any plans to use them. 8. IT’S BEEN HAILED AS "THE NEW GOLF." 9. THE CREATORS HELPED DEVELOP ITS PARKS AND REC COUNTERPART. Even if you’ve never played Catan in real life you may recognize it from the television series Parks and Recreation. The game is a favorite activity of Pawnee’s resident uber-nerd Ben Wyatt—he plays it at his bachelor party and even ranked at a national competition for the game. He’s so into it, in fact, that he invents a Catan-inspired board game of his own in season six. "We knew that there was going to be a story point that Ben was going to have about a week off between jobs," Parks and Rec co-producer, and writer of the "Cones of Dunshire" episode, Dave King told Vulture. "As soon as the idea came up for Ben to design his own Catan-like board game, I remember Mike Schur, our creator and showrunner, was like, 'Yes. That’s it. Absolutely.'" To create a game that was both funny and believable at the same time, the show’s producers reached out to Mayfair Games, the real-life board game company behind Catan, for help. The result was Cones of Dunshire, a game that Mayfair’s Alex Yeager told Nuvo, "trie[s] to walk a line between something playable, and something still rooted in the crazed imagination of an unemployed geek." The game was a success in the Parks and Rec universe, and in 2014 fans got the chance to play it in the real world. At that year’s Gen Con gaming conference in Indianapolis, 33 players paid $100 each to play a realized version of the game for charity. Participants were treated to the above message from the game’s architect beforehand, courtesy of Parks and Rec actor Adam Scott. 10. 'THE SETTLERS OF' WAS DROPPED IN 2015. 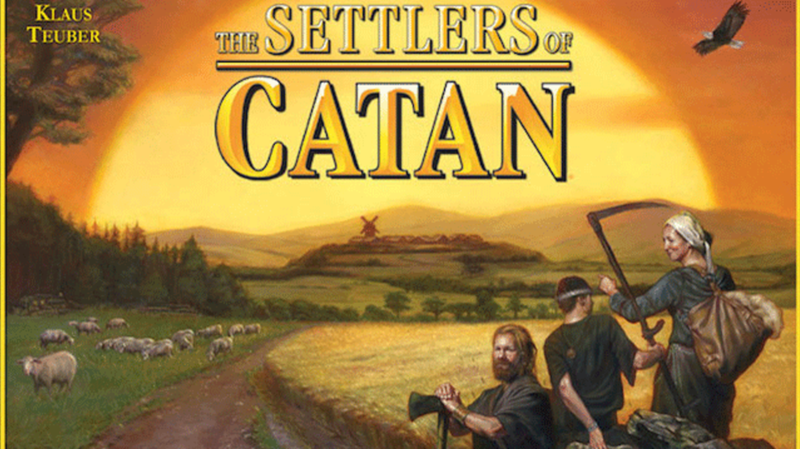 After 20 years on the market, the manufacturers of The Settlers of Catan decided it was time for a name change. Since 2015, all new editions have been sold under the simplified title Catan with fancy new design elements to boot. Newer boxes are portrait-shaped, and all art for the covers, cards, and tiles were produced by a single artist for a more consistent aesthetic. The new games may look sharper, but they also make the edition you’ve been playing with since the '90s that much more sentimental. 11. OVER 18 MILLION COPIES HAVE BEEN SOLD. The Settlers of Catan hasn’t rung the death knell for Monopoly as some outlets predicted, but it's done well for itself regardless. Over 18 million copies of the game have been sold since its release. Today it remains one of the most popular board games on Amazon, outselling titles like Life, Battleship, and yes, Monopoly. Its popularity is also widespread, with sets available in 30 different languages around the world. 12. KLAUS TEUBER FOLLOWS HIS OWN STRATEGY TO WIN. There are plenty of ways to approach a game of Catan, but some strategies have a stronger foundation than others. Earlier this year, Great Big Story asked the game’s original testers, Benny and Guido Teuber, about the methods they’ve developed over the years. Benny recommends lots of complaining: "Even though you know you’re winning, you still have to say you're not." Guido says he loves "building cities as early as possible in the game." Their father and Catan’s inventor Klaus Teuber also gave his two cents. His advice is sweet and simple: "Never build the longest road at the beginning."